Split, on Croatia’s Dalmatian coast, feels like a city that time has forgotten. The ancient centre is like nothing you’ll have seen before, with a whole district taken up by a sprawling Roman palace, going strong after 1700 years. Over the centuries this architecture has been kept intact and then incorporated into newer buildings, like St. Duje’s Cathedral, the heart of which is a 4th-century mausoleum. 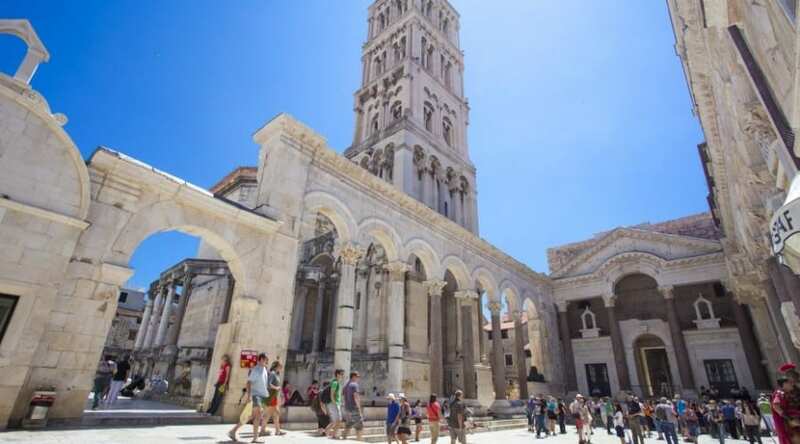 Diocletian’s Palace dominates the city’s historic core. There’s nothing else like it in Europe: It’s a wonderfully-preserved 4th-century complex blending Diocletian’s stately retirement villa with the remnants of a large military camp. Such is the scale that it’s more of a citadel than a palace, and surprises await around every corner. Needless to say that the palace is UNESCO-listed, and you’ll even be able to tread the original Roman streets that cut through the complex: decumanus and cardo still have their original paving stones. It won’t come as a surprise that scenes from Game of Thrones have been filmed at this stunning location. You’ll need at least a few hours to get a real taste of the old city and there’s no better way to do this than on foot. Head for Pjaca square where Split’s old town hall overlooks a sophisticated plaza of shiny marble tiles and cafes with outdoor seating. Fruit Square is also essential, taking its name from the market that was held here for centuries. 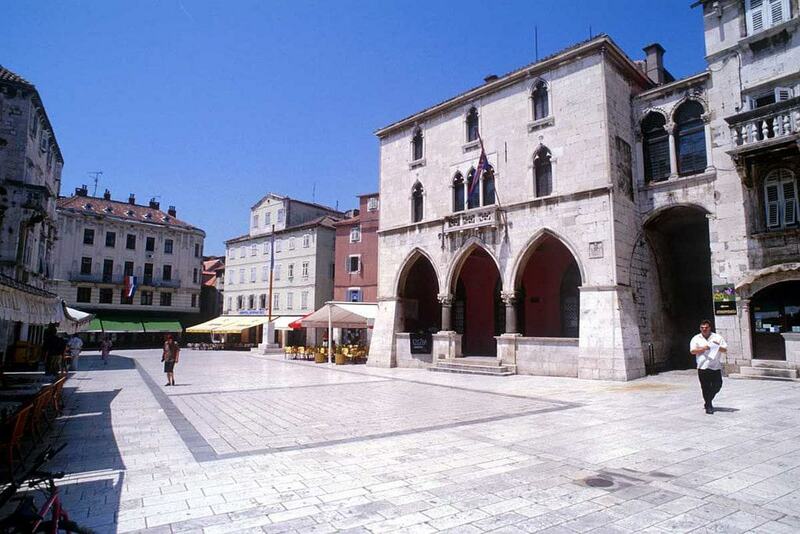 Here there’s lots of beautiful renaissance architecture, remnants from Split’s Venetian era. To see how Split’s inhabitants go about their day try Marmont Street, which extends down to the water and is flanked at the upper end by shops, cafes and restaurants. One of the enchanting things about the architecture in old Split is the way ancient buildings have been repurposed. 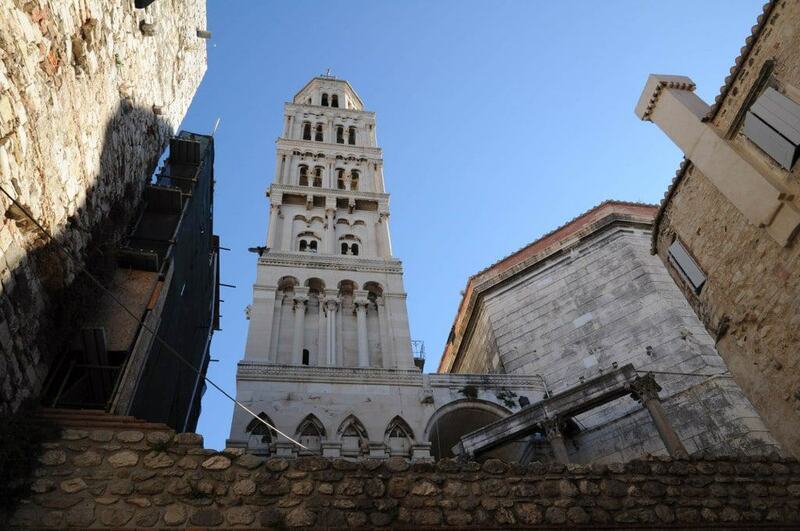 The finest example is Split’s cathedral, which was once Diocletian’s mausoleum. The central portion of this structure dates to 350, making St Duje’s the oldest cathedral building in the world. It’s a real thrill to see how Roman elements like the original ring of 24 supporting columns mingle with the hallmarks of a catholic place of worship. Also take a moment to check out the cathedral’s romanesque wooden doors, which have survived unaltered since 1200. 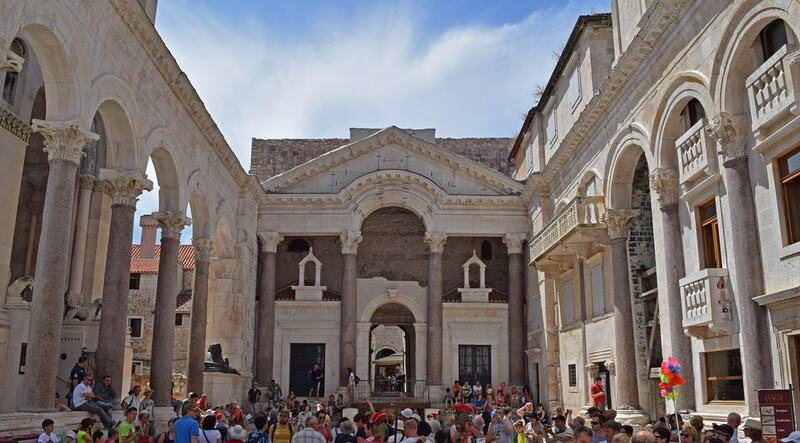 Peristil Square is the original Roman court, where you can soak up the architectural majesty of old Split. Afternoon cups of coffee don’t get more dramatic than this, that’s for sure! Diocletian made his public appearances at just this plaza and his devoted subjects would prostrate themselves in front of the former emperor. Still standing are the two 3,500-year-old Egyptian sphinxes brought to the city by Diocletian. The epic stone monuments around the square have endowed Peristil with fine acoustics so you could definitely catch an opera or theatre performance in the summer. Just west of the city is this steep, 170-metre-high hill forested with cypress and Mediterranean pine trees. 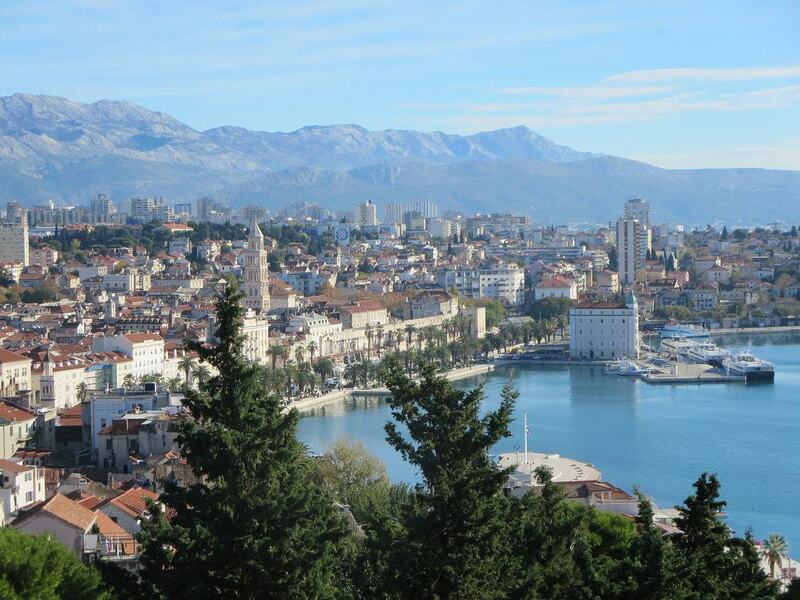 It’s just the ticket if you’re in the mood for a bit of fresh air and exercise, or want to track down some of Split’s less frequented landmarks. Especially interesting is the Jewish cemetery on the eastern side of the hill. No burials have been made since 1945, but many of the tombstones are still legible and some go back to the 1700s. There are also two churches on the hill, St. Nicholas from the 1200s and St. Jerome from the 1400s with a renaissance altarpiece carved by the Venetian Andrea Alessi. Next to the cathedral is Split’s iconic bell tower, a lovely sight, six storeys-high that tapers as you scale the upper levels. On your way up you’ll be exposed to the elements, and you can peer through the tower’s paired arched windows, which are a classic feature of romanesque design and have hardly been altered since the 1000s. At the top your reward will be views of the Split cityscape and the Adriatic, well worth the slightly onerous climb and the small admission fee! Both the subject and creator of this hefty statue outside the Golden Gate are a big deal. Ivan Meštrović, the sculptor, was a master of his craft and after communism arrived he continued his career in America where his public works there are as cherished as ever. More on him later. 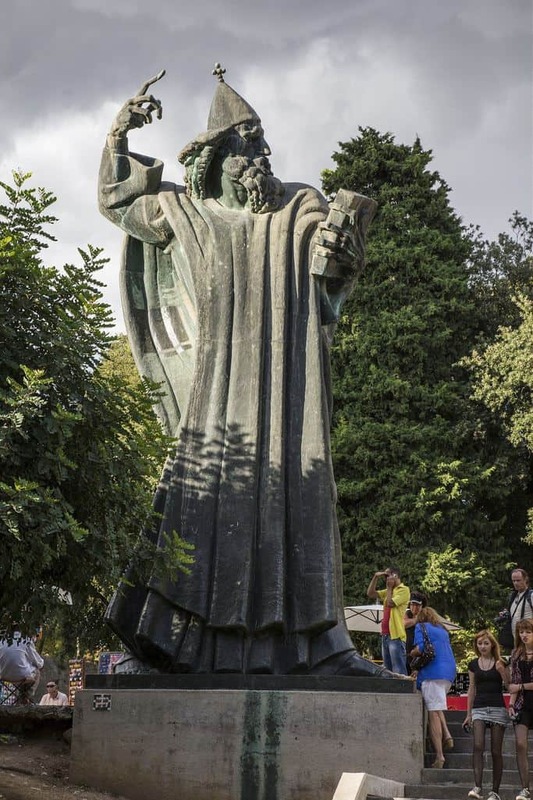 Grgur Ninski on the other hand is a 10th-century bishop a Croatian icon, who by conducting religious services in the Croatian language defied the pope, helped spread Christianity in the region and establish Croatian national identity. People rub Ninski’s big toe for good luck, and years of contact have made this little nub of bronze gleam. When you see it you’ll know why this stronghold on an upland pass has also appeared in Game of Thrones. Klis Fortress is balanced on a bluff above the terraced hills of the eponymous town, and is framed by yet more towering cliffs of pale grey rock. It’s a sight you won’t forget and blood has been spilled for this structure throughout its two and a half millennia. The ancient Illyrians were the first to build a fortress here and for centuries throughout the medieval era Klis was the seat of the Croatian Kings. 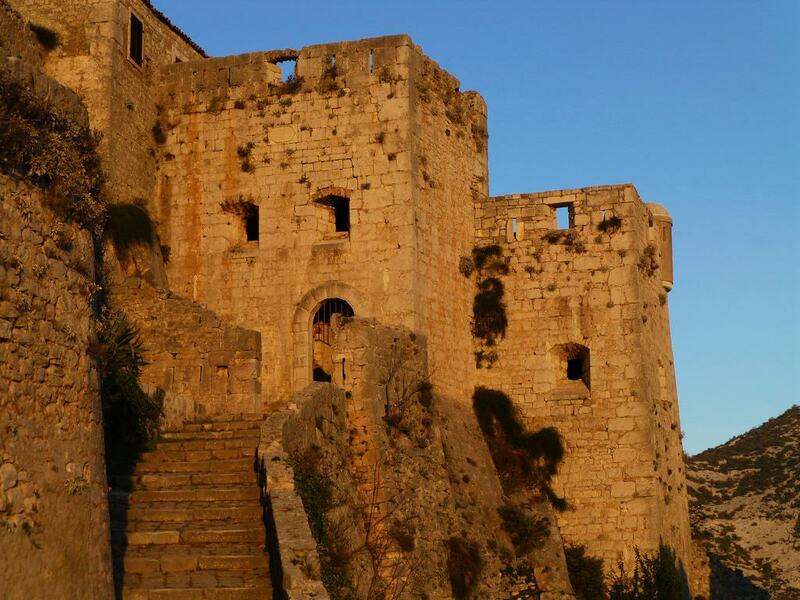 During the Ottoman Wars whoever held this castle, 10 kilometres northeast of Split, held the upper hand in the region. 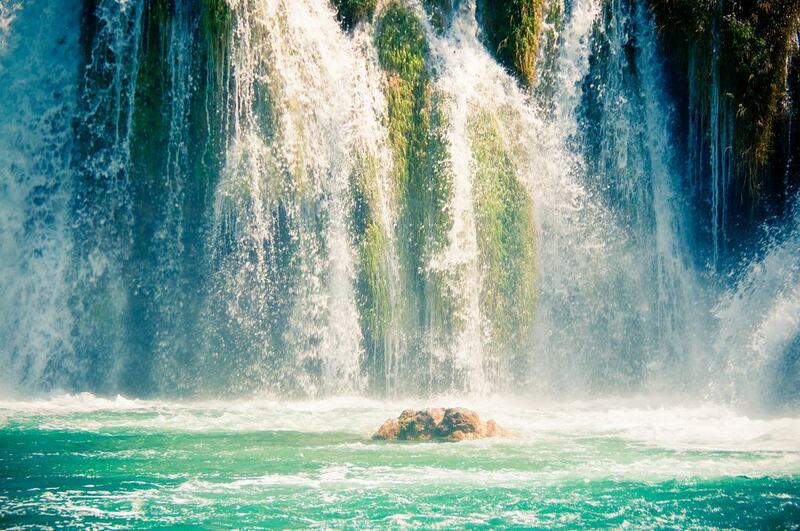 An hour up from Split, this national park follows the course of the Krka River. The sublime Stradinski Buk is what many people come to see. It’s a large natural pool, 400 by 100 metres, fed by travertine waterfalls on one end and then emptied by cascades on the other. There are 17 waterfalls in this spot alone and tallest gets up to almost 50 metres. You could lose hours feasting your eyes on this scene: The pool is enveloped by rich greenery and is also admired for the way the sunlight dances in the swirling water. Also be sure to make time for the cascades at Roški Slap and Visovac Island, where there’s a 15th-century monastery. If you’re wondering where the stuff from all of the historical landmarks in and around Split has ended up, here’s your answer. Some 20,000 pieces have been collected by the Archaeological Monument Museum, only a quarter of which can be displayed. Most of these are from medieval times and generally include jewellery, weapons, armour and everyday household items. In terms of Croatian culture, the most valuable pieces are the various stone inscriptions, reliefs and carvings relating to the Croatian kings, nobility and clergy from the 800s to the 1100s. If you’d like to delve into the background of one of Croatia’s most noted artists (and the sculptor of the city’s Grgur Ninski statue) this is a fascinating way to spend an afternoon. 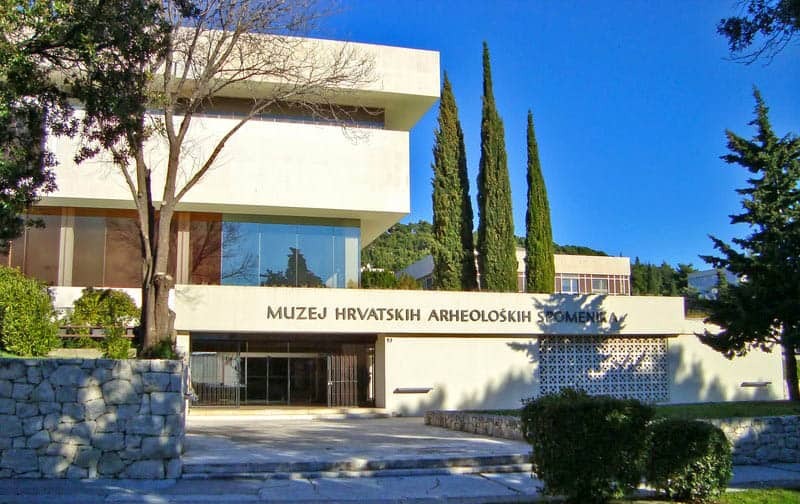 It’s the largest collection of works by Meštrović to be found anywhere, with almost 200 sculptures as well as sketches, furniture pieces and architectural plans. 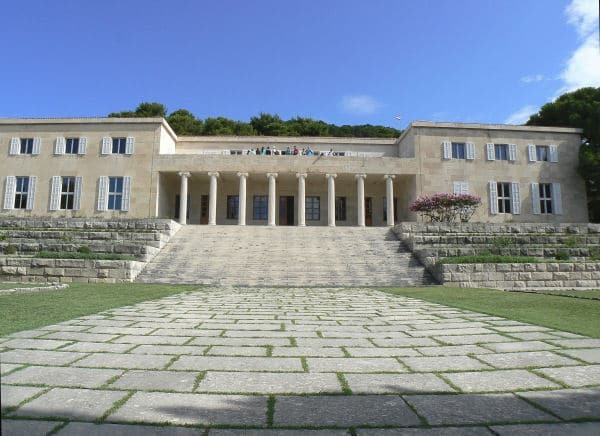 The museum is in a building from the 1930s designed as a home by the artist himself, and after falling into disrepair during the Yugoslav War it was reopened in 1998. As well as interior exhibits there’s an extensive outdoor sculpture garden to take in. 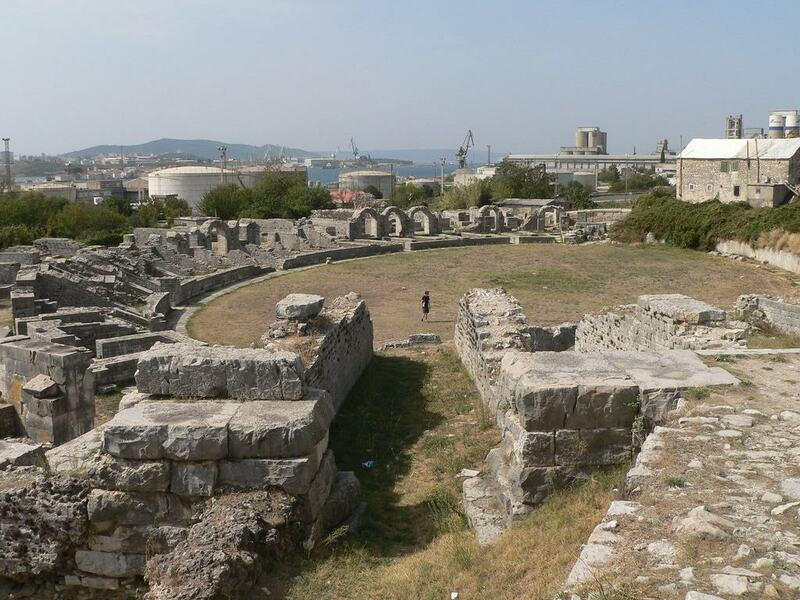 An easy bus ride from the centre of Split, Salona was once the Roman Empire’s foremost city in the Balkans. 60,000 people lived in Salona’s at the city’s peak and although it was eventually ransacked and abandoned in the 600s the archaeological park is an enlightening day out, preserving significant fragments of the structures that used to stand here. The most obvious of these is the amphitheatre, which once had a capacity for 18,000 spectators. You can trace the perimeter of the area, and see how the terraced seating harmonised with the slope of the hill one which its built. Yet another UNESCO site, Trogir looks much the same now as it did in its medieval heyday. 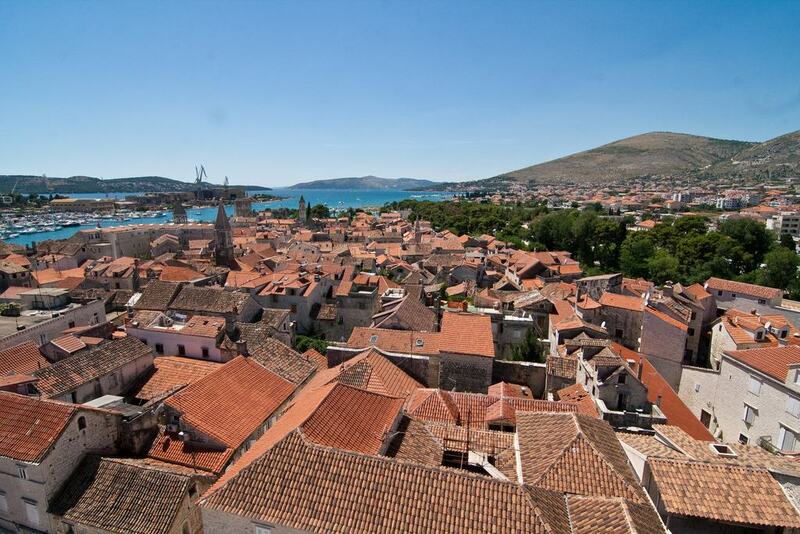 You don’t need to be a historian to fall in love with Trogir: It’s the best-preserved ensemble of romanesque and gothic architecture in Europe. The location is part of the charm, as the city is a small, fortified island connected to the mainland by a bridge. Trogir’s 15th-century walls protect a labyrinth of ravine-like streets on which you’ll pass buildings unchanged since the 1200s. There are a 10 historic churches in the old centre, including the exquisite 13th-century cathedral. 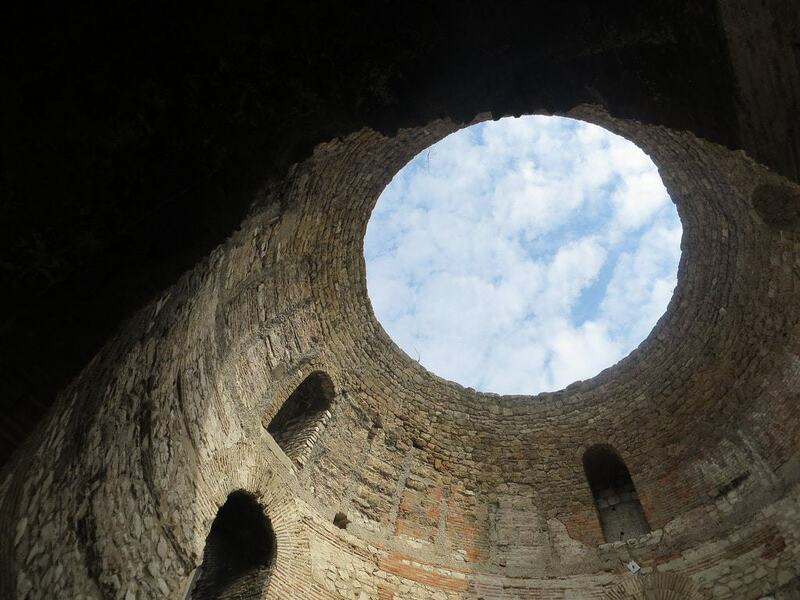 There is a great Trogir History & Culinary Tour available which you can book right here. Croatia’s coast is a natural wonder, especially around Split, where islands serve as a barrier to keep the clean waters calm and almost transparent in the shallows. So the incredible array of offshore landforms combined with the countless remote coves where you can weigh anchor, make Split one of Europe’s best places to charter a yacht or motorboat, whether you prefer bareboat or skippered. It’s a busy market here with lots of charter agencies competing for business and keeping rentals affordable. At the marina are shops where you can stock your vessel with food and drink, and from there you’re free to embark on your adventure. 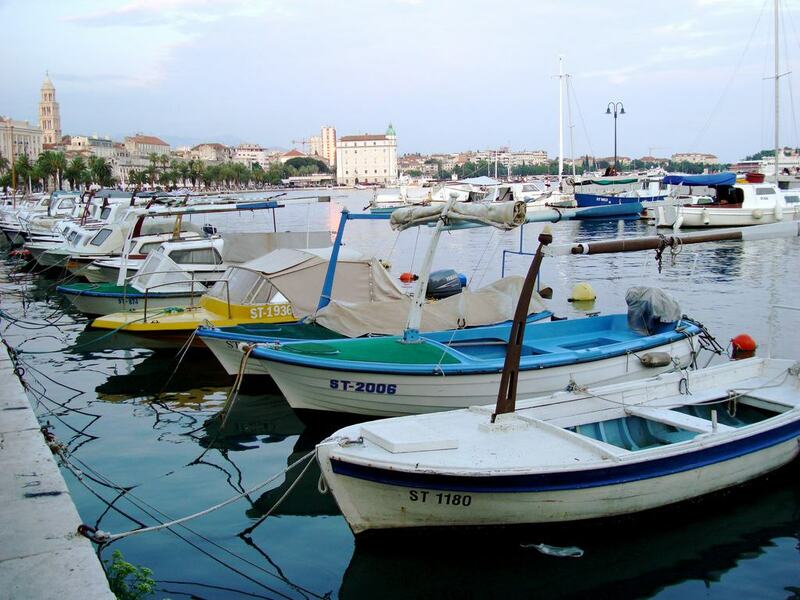 Split’s superb culture makes it easy to forget that the city can be a fabulous seaside destination. You won’t need to venture far either: Right in the city, at the foot of Marjan are a sequence of fine natural beaches edged by the hill’s aromatic pine woodland. 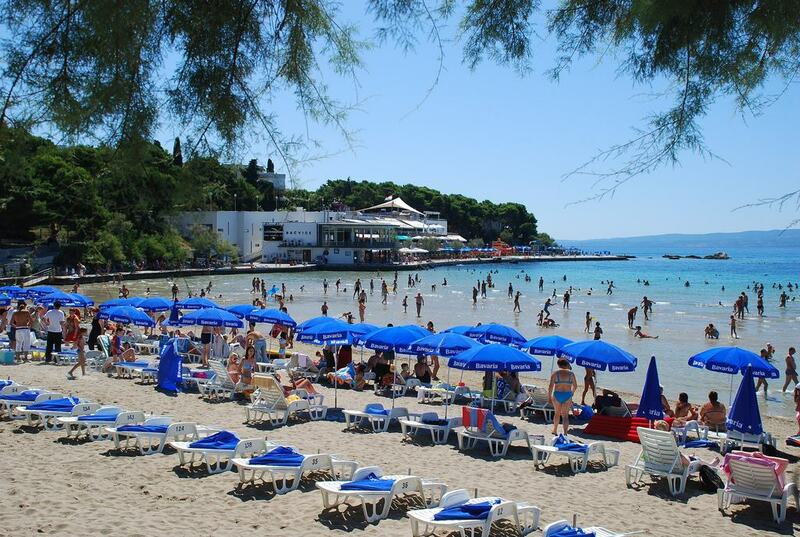 Travel a little way east along the coast from Split and you’ll come to Stobrec, a lovely horseshoe bay with shallow waters where smaller children can paddle in safety. The headline sandy beach in the area is Bacvice a southeastern suburb of Split, where sun shades are for hire and you’ll have all the waterfront amenities you could need.